I always wondered how much use pre-cuts (charm packs, jelly rolls etc) actually were, and what you could really make with that little stack of squares or strips. Finally I decided that the only way to find out was to have a go, so I bought two charm packs - a PB & J by Basic Grey for Moda one, and a wren and friends by Gina Martin for Moda one. I turned the pb&j one into an awesome wall hanging, and the wren and friends one has become a series of cushions (I'll write about those in another post). I put the charm squares together in fours, and then arranged them on point alternating with squares of a creamy coloured cotton (nothing special, just the standard plain cotton from my local shop). I quilted it using an orange peel pattern following this tutorial over at petitdesignco. I'm not very well practised with free motion quilting, so loved this method of doing the orange peel quilting as I could use a walking foot. It's really simple to do, but so effective. 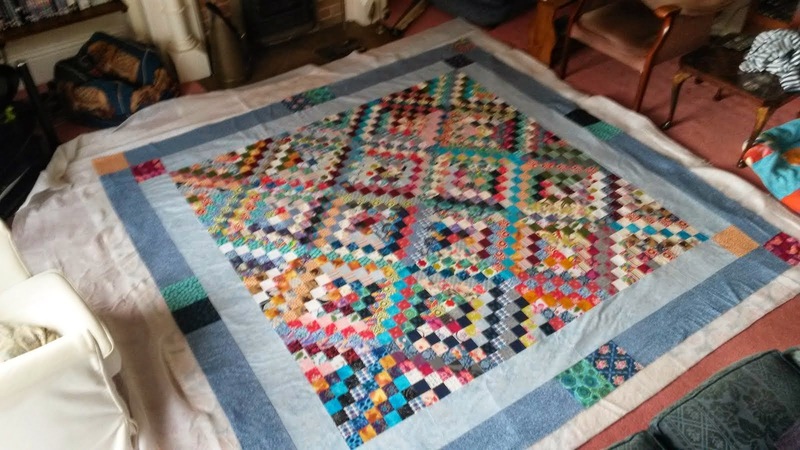 I also quilted in the ditch along the edges of the large squares - that's visible from the back but you can't really see it from the front. It's backed in the same creamy cotton as I used for the background on the front, and I bought some extra yardage of one of the charm square fabrics for the binding. I'd always intended this to be a wall hanging, so during construction I added a couple of pockets to the top corners so that it would be easy to hang using a bamboo cane. what a great wall hanging. I recognized the fabric right away as I bought some to make a quilt as well. I haven't started the quilt yet but I still love the fabric. Thanks for putting in the links, I'm trying to break out of my comfort zone with my quilting so I'm looking for new ideas. I'm here from finish it up friday and like your colorful rainbow quilt as well.